An optical chip developed at INRS by Prof. Roberto Morandotti’s team overcomes a number of obstacles in the development of quantum computers, which are expected to revolutionize information processing. An international research team has demonstrated that on-chip quantum frequency combs can be used to simultaneously generate multiphoton entangled quantum bit (qubit) states. Quantum computing differs fundamentally from classical computing, in that it is based on the generation and processing of qubits. Unlike classical bits, which can have a state of either 1 or 0, qubits allow a superposition of the 1 and 0 states (both simultaneously). Strikingly, multiple qubits can be linked in so-called ‘entangled’ states, in which the manipulation of a single qubit changes the entire system, even if individual qubits are physically distant. This property is the basis for quantum information processing, with the goal of building superfast quantum computers and transferring information in a completely secure way. Professor Morandotti has focused his research efforts on the realization of quantum components compatible with established technologies. The chip developed by his team was designed to meet numerous criteria for its direct use: It is compact, inexpensive, compatible with electronic circuits, and uses standard telecommunication frequencies. It is also scalable, an essential characteristic if it is to serve as a basis for practical systems. But the biggest technological challenge is the generation of multiple, stable, and controllable entangled qubit states. The generation of qubits can rely on several approaches, including electron spin, atomic energy levels, and photon quantum states. Photons have the advantage of preserving entanglement over long distances and time periods. But generating entangled photon states in a compact and scalable way is difficult. “Most importantly, several such states have to be generated simultaneously if we are to arrive at practical applications,” says INRS research associate Dr. Michael Kues. Thanks to these integrated quantum frequency combs, the chip developed by INRS is able to generate entangled multi-photon qubit states over several hundred frequency modes. 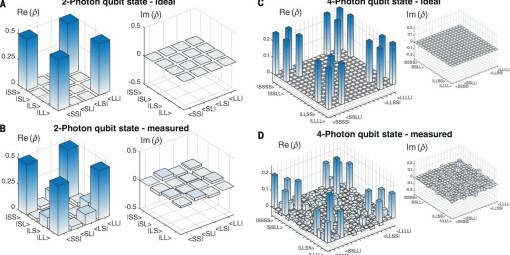 It is the first time anyone has demonstrated the simultaneous generation of qubit multi-photon and two-photon entangled states: Until now, integrated systems developed by other research teams had only succeeded in generating individual two-photon entangled states on a chip. The results published in Science provide a foundation for new research, both in integrated quantum photonics and quantum frequency combs. This could revolutionize optical quantum technologies, while at the same time maintaining compatibility with existing semiconductor chip technology.